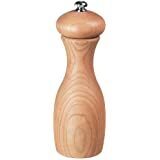 Amazon's Choice for "microplane zester"
Fletchers' Mill Marsala Collection Pepper Mill, Cherry - 7 Inch, Adjustable Coarseness Fine to Coarse, MADE IN U.S.A.
A versatile must-have tool for the kitchen! 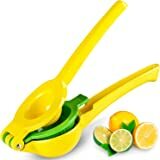 This tool is normally used to grate citrus for perfect lemon, lime, and orange zests or to create pillowy mounds of parmesan cheese. 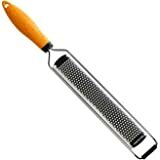 However, it is also a great tool for grating spices like nutmeg, cinnamon, and even chilies into fresh ground powders. 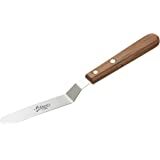 If your dish requires fresh grated ginger or garlic, this tool will do that job as well. Customers have let us know that they even use this tool to remove burnt edges from cookies and bread. What will you use it for? What is the difference between Original Classic and Premium Classic? 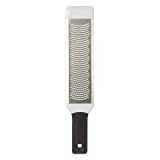 The Premium Classic Zester Grater by Microplane provides a soft touch handle, instead of hard plastic. 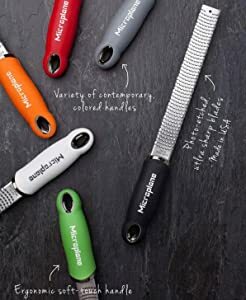 In addition this line provides a choice of handle colors. You can expect the same grating or zesting experience with either tool. What makes Microplane so sharp? 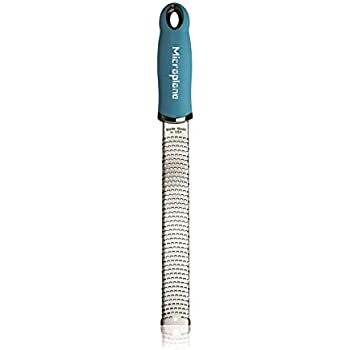 The Microplane is the standard for sharp, efficient grating and zesting in both home and professional kitchens - just ask any chef if they use a Microplane! Dining out anywhere will usually lead to a Microplane sighting. 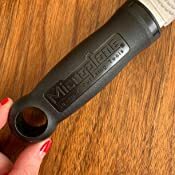 Microplane began using this signature technology in the 1990's. Most tools use stamped or cut metal. 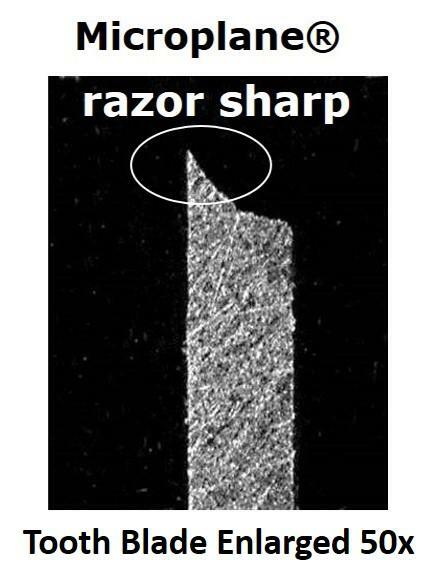 Photo-etching creates a much finer point, which means your Microplane digs in and performs better. The photo-etching process takes place in Russellville, Arkansas; the grating blades for zesters are all made in USA. 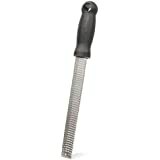 The high-performance premium classic Series graters, which feature the company's iconic long and narrow, rasp-style design that originated in the woodshop, are expertly crafted with surgical grade stainless Steel blades with razor-sharp edges that effortlessly cut through hard and soft foods without tearing or shredding. 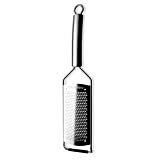 The zester/grater is perfect for besting citrus, grating hard cheeses and ginger. 4.0 out of 5 starsBeware Sharp, Unfinished Edges! Great microplane zester, very sharp. Love the little rubberized "feet" on the bottom that eliminate the possibility of its scratching the surface upon which you rest it to grate. It makes fast work of hard cheeses and zests. We love our freshly grated Asiago over home made pasta, so this little beauty is often at the table. One little flaw, however, prevents me from giving it five stars. 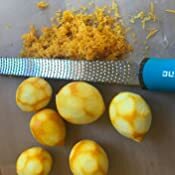 When I used it to grate lime zest today, it accumulated on the underside of the zester, as many food items do. Never expecting a problem, I used my index finger to wipe it off into the bowl. YOWWWww! The sides of the zester, which curl around to the back, were not finished. One of them gave me a very nasty slice across the end knuckle of my index finger. The last brand of microplane zester was finished smoothly, so it never occurred to me that this might be a problem. 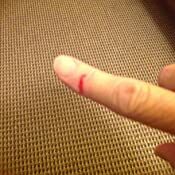 In the future, I'll be sure to use a pastry brush or the tip of a dinner knife to dislodge the grated item. Lesson learned! 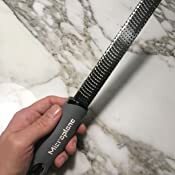 5.0 out of 5 starsA perfectly "Grate" kitchen tool! 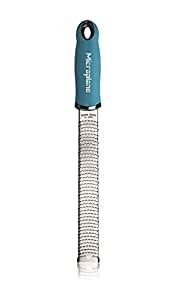 This is a review for the Microplane 46220 Premium Zester/Grater, Turquoise by Microplane. It's easy to settle for any old zester, or keep using your old dull one, especially if you don't use it very often. Like, how much difference could there be? But I'm convinced that the better the quality the tool, the more often you'll likely use it, and this Microplane 46220 fits the bill. This is probably the last zester I'll ever need to buy. It's well-made from surgical stainless steel, dishwasher safe, and completely functional. It has a sturdy plastic cover that is hand-washable. 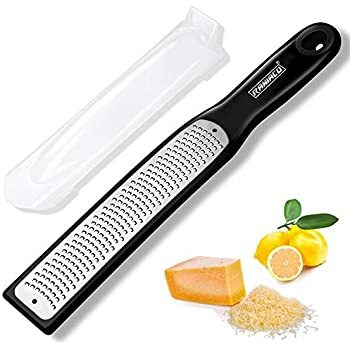 I use this zester/grater for cold chocolate, hard cheeses, citrus, ginger, and garlic, and it's also perfect for nutmeg and other hard spices. It has a nice comfortable feel in the hand and provides a solid grip. The grate is very sharp and foods wind up properly zested rather than torn or shredded. Using a beautiful, quality tool is so much more fun than making due with an inferior product. I'd certainly buy this again. If you found this review helpful, please click the "yes" button below. Thanks and happy zesting! 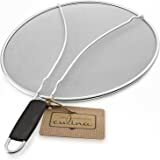 I belong to Cooks Illustrated online and always check their equipment review before I purchase ANYTHING for my kitchen. I've had microplanes in the past, I also give them as gifts. Every home should have one or two. This is the one Cooks Illustrated suggested "Buy the winner" so that works for me. It's IMPERATIVE you keep the hard plastic sleeve on it, otherwise, it could bend in the utensil drawer and end up breaking -- but sometimes other people in my kitchen haven't gotten that memo. Wash it immediately after using it, don't put it with anything else until that plastic sleeve protector is on it. 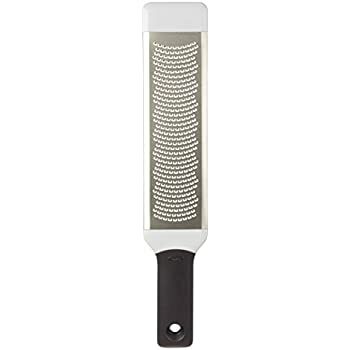 Prior to using the Microplane I had only used cheap graters that one would find at places like TJ Maxx for a couple of dollars. Hence I was hesitant about spending over $10 for a grater. After my previous grater broke down though, I decided to pull the trigger and try this item out. Packaging was decent and delivery was fast as expected. For my first use I grabbed a wedge of Parmigiano-Reggiano to garnish a tomato soup I was making. I can still remember that first grate. Smooth, plentiful, and effortless. This may seem like an exaggeration, but for someone who had only used cheap graters it was an eye-opening experience. What would generally take me at least 15-20 grates came out easily from one full swipe of the Microplane. At that point I somewhat forgot about the soup and continued to grate in awe leaving me with much more cheese than I would need. This should give you a general understanding of how please I was with the product. 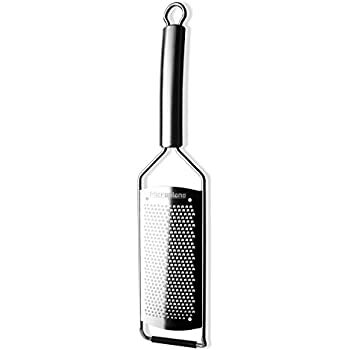 Anyhow, I strongly recommend this grater for its sleek look and undeniable performance! On a side note, I was initially confused by the product numbers of the Microplane, but after a quick look it was clear that the different X's in 46X20 referred to the color of the product. In case anyone is confused as well there's no difference in the product! This is too fine. It turns ginger into mush and takes a lot of rubbing to process it. It doesn't have enough bite to get into a lemon peel. I also bought the Microplane 38000 model which is labeled "coarse" and it is exactly perfect and makes great tiny shreds. This one is very disappointing. A waste of $15. Loved loved loved this when I first got it. 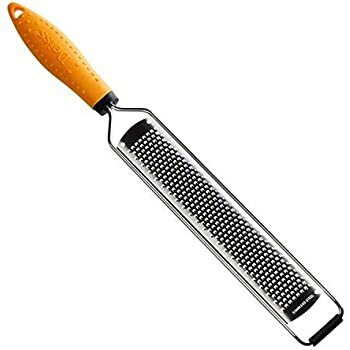 I use it to grate ginger for ginger tea and I use it about 2-3 times a day. But...after a few weeks it was noticably duller, and at this point its basically a brute strength effort to grate. But frankly, for the price, it was worth it. For the price, this little gadget cannot be beat. 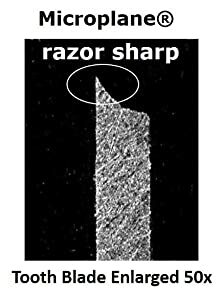 It is sharp, honed, and effective. 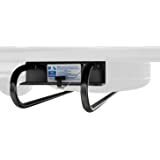 Best of all, it grates incredibly easily with application of minimal pressure. I have not shredded my knuckles even once. 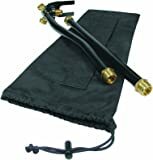 It rinses clean quickly, even when used for zesting citrus. I also love the color, and it is very easy to find in my overflowing gadget drawer. The protective shield is a little tricky to put back on. Due to the sharpness, I would recommend being very careful when using this device around children. Treat it like a knife or an other dangerous object and keep it well out of their reach. 5.0 out of 5 starsIt's Grate! EXCELLENT upgrade from my first Microplane purchased 15 years ago! I'd been storing my old one in my gadget drawer with the original paper sleeve to protect my fingers from cuts. The old one was still sharp and straight after many years of frequent use. 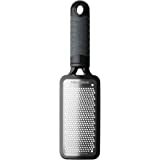 I've used this guy for grating parmesan, chocolate, ginger, garlic, onions, nutmeg, cinnamon and of course for zesting lemons and limes. It's easy to use, durable and easy to clean- I wash it by hand and allow it to dry fully before storing. Never a spot of rust.